Dene Ward was a city girl who married a country boy. They raised their family in the country, as their father was raised, and she quickly learned about toiling in the garden, chasing loose pigs, looking for snakes in the oddest places, and never taking for granted electricity, running water, and a clear path from the road to the house—half a mile down the country lane. Join her as she shares the lessons she has acquired with hard experience, which have also given her more insight to the rural-based lessons Jesus taught, and find yourself too, a little closer to God. When encroaching blindness took her music teaching career away, Dene Ward turned her attention to writing. What began as e-mail devotions to some friends grew into a list of hundreds of subscribers. Three hundred sixty-six of those devotions have been assembled to form this daily devotional. Follow her through a year of camping, bird-watching, medical procedures, piano lessons, memories, and more as she uses daily life as a springboard to thought-provoking and character-challenging messages of endurance and faith. Cooking has always been a part of Dene Ward’s life. She grew up in a house where they were always feeding someone and followed that same path as a wife and mother. On the table, she has always offered a nourishing meal; she now offers this collection to feed your souls, lessons from her hearth to your heart. Dene and her husband Keith have gardened for nearly 40 years, which has shown her why God's prophets and preachers, including Jesus, used so many references to plants and planting--it's only natural. 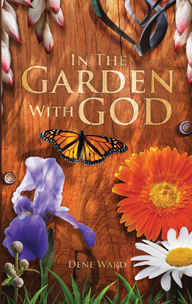 Through 52 devotionals join her for a walk In the Garden with God.